The main arteries that carry blood from the heart to the brain are the right and left internal carotid arteries (ICA) in the neck. In older people, the origin of these arteries is a common site of narrowing caused by build-up of fatty tissue, inflammation and scarring. This process is called atherosclerosis, arterial disease or plaque formation. The narrowing is called carotid artery stenosis. Figure 1 shows the left and right ICAs and the left one has an atherosclerotic plaque causing narrowing or occlusion. Atherosclerosis is a generalized process and affecting arteries in different parts of the body to a variable degree. Another common site is the heart arteries which can block to damage heart muscle (heart attack). Stroke is the sudden loss of body function due to sudden interruption of blood supply to the relevant (controlling) part of the brain. Symptoms vary according to what part of the brain is affected. The most common deficits include sudden loss of normal speech and or loss of normal arm or leg function and/or loss of normal visual function. About 80% of strokes are 'ischaemic' meaning a brain artery has been blocked as may occur as a complication of a plaque. 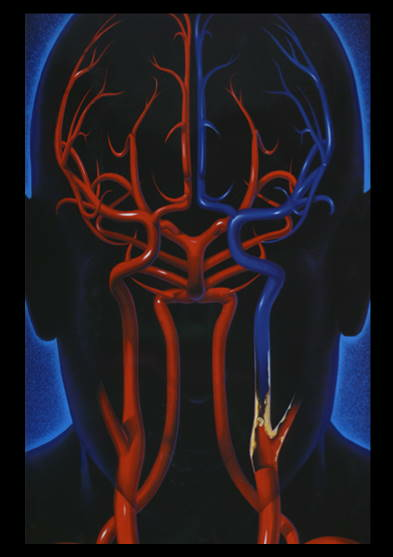 About 20% of all strokes are haemorrhagic, due to a bleed from a brain artery. Moderate or severe carotid stenosis means the carotid artery narrowing has progressed to cause a 50-99% narrowing of the artery. Moderate or severe carotid stenosis causes about 10% of all strokes and affects about 10% of the general population by the time they are aged 80 years. The type of stroke caused by carotid stenosis is ischaemic. This means the brain arteries become blocked (stopping blood flow) because the internal carotid artery closes off all together (occlusion) at the site of narrowing or fragments of carotid plaque (emboli) dislodge from the ICA narrowing and block brain arteries downstream. Most people with carotid stenosis are symptom-free or "asymptomatic" and will remain so during their lifetime. This means they have not had a stroke or mini- stroke (transient ischaemic attack, TIA) in the territory of the narrowed ICA. A minority of patients are or will become â€˜symptomatic,â€™ which means they have had stroke or mini-stroke (TIA) in the territory of the narrowed ICA. Patients with recent stroke or TIA have a much higher short- term risk of recurrent stroke than asymptomatic people. This has important implications about what kind of treatments or procedures are likely to reduce their future risk of stroke and other complications of arterial disease. i. Medical treatment: identification of risk factors for heart and arterial disease (atherosclerosis) followed by risk factor reduction by supporting healthy lifestyle habits and the use of appropriate medication. The main risk factors are high blood pressure, smoking, high blood cholesterol, diabetes and being overweight or physically inactive. ii. Carotid endarterectomy (CEA): an operation to remove fatty tissue (plaque) that is deposited in the arterial wall and is causing the narrowing. iii. Carotid angioplasty/stenting (CAS): compression of the fatty tissue (plaque) in the arterial wall using an expandable wire mesh (stent). Like in heart artery angioplasty/stenting, the access to the targeted blood vessel is usually from an artery located in the groin.